One of the biggest challenges of user experience design is predicting what the user wants. The best system possible is one that knows what you want completely and provides it before you ask. The worst system is one that thinks it knows what you want but is always wrong. An example of the former is sitting down to your computer in the morning and seeing the two new sites you always open first ready and loaded. An example of the latter is Clippy, the adaptive menus in Microsoft Office 2003, and any scene from the Jetson’s. Two ways to predict what the user wants are by 1. knowing him better, and by 2. having more intelligent tools. A browser knows you go to Huffington Post and the New York Times every morning, because it sees your daily browsing habits and knows you’re liberal scum. But if a task is common and difficult, sometimes a more intelligent tool can be the fix. Here’s a more intelligent tool to get excited about: content-aware image resizing in Photoshop CS4 (hat tip: Frederic Wenzel). This feature lets you resize an image while respecting its subject and complexity by scaling the non-complex, boring bits. Adobe has a promo video up, and here is a video from the Israeli researchers who thought of it first. This is a photo editing task which is normally quite difficult and tedious, and with better tools the user experience is massively improved. In fact, I played around with this feature in the GIMP this weekend (there it is called “liquid resizing”), and while it’s not as fun as Photoshop’s feature because it doesn’t update the picture on the fly, it works extremely well, especially when protecting certain areas of a picture and shrinking others, in order to put emphasis on, for example, the person in the portrait. I remember seeing the original video and paper on this a year or two back – really impressive stuff. Glad to see its finally becoming mainstream. 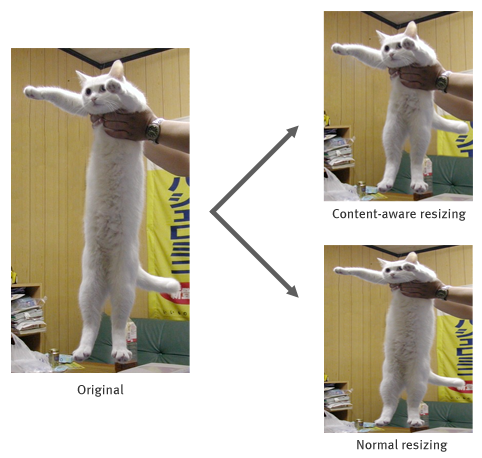 The very coolest thing about content-aware resizing is that it can also be used to extend the size of things. Your longcat can turn into a looooooooooooooongcat.